(Dover, NH – June 1, 2018) – The New Hampshire Maker & Food Fest (formerly the Dover Mini Maker Faire) is celebrating its 6th year on Saturday, August 25, 2018. Organized by the Children’s Museum of New Hampshire, this one-day festival is a chance for local inventors, entrepreneurs, tech-enthusiasts, artisans and more to showcase their talents. Makers of all kinds are invited to participate and applications are now being accepted. The NH Maker & Food Fest is the state’s only fair of its kind. It’s not a typical New England fair with cotton candy and ferris wheels. Instead, admission to the NH Maker & Food Fest will include access to the latest technology innovations. You’ll be invited to play with robots, create and craft using unique materials, participate in science experiments, dive into virtual reality and so much more. As a Maker participant, presenter, performer or food vendor, you can show off your skills and share your knowledge with over 1,600 interested adults and children. 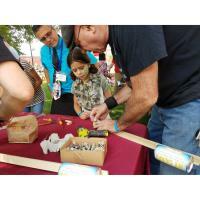 All ages are encouraged to apply to be a Maker. As a Maker you can sell your products, offer a workshop or demonstration, do a performance or simply have an exhibit or booth sharing your knowledge. Applications are online at www.childrens-museum.org. The deadline for Makers to apply is Friday, August 10. The New Hampshire Maker & Food Fest will take over downtown Dover, with four locations: upper and lower Henry Law Park, The Children’s Museum of New Hampshire, and One Washington Mill. Early bird tickets will be on sale June 1-31 for $8/person. Advance tickets will be on sale August 1-24 for $10/person, and tickets at the gate will be $12. Children ages 5 and under are admitted free. New this year is a Family Fun Pack – two adults and up to 3 children ages 6-17 for $35 in advance or $40 at the door. Tickets and more info can be found online at www.childrens-museum.org.